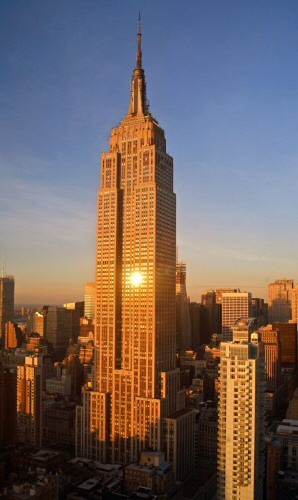 The Empire State Building in New York City is a landmark skyscraper. The building is currently owned and managed by W&H Properties. From the completion of the structure until 1972, the building was the tallest structure in the world. The building was designed by William Lamb, who completed the design in less than two weeks, using earlier designs from another project. The building was designed from top to bottom. The building's design is in the distinguishing Art Deco style. In 1986, the building was designated a historical landmark in New York City. In 2007, it made number one on the list of America's favourite architectures. Excavation started in January of 1930 and construction actually started in March of that year. The project involved over 3,400 workers. The ribbon cutting ceremony was on May 1, 1931 and the building was officially opened. The construction was an intense competition for the tallest building. Several other projects were competing for the title, as well. Just fifteen months after the project commenced, it was completed. The building rises to 1,250 feet and if you include the 203 foot pinnacle, the full height reaches over 1,453 feet high. There are 85 stories of commercial office space, which represents 2,158,000 square feet. On the 86th floor there is both an outdoor and indoor observation deck. The remaining stories embody the 1930's Art Deco style tower capped by an observatory on the 102nd floor. On top of the tower is the pinnacle covered with broadcasting antennas and a lightening rod at the very tip. The building was the first structure to have more than 100 floors. The building has 73 elevators and over 6,000 windows. The base of the building is approximately two acres in size. The exterior of the structure was built using limestone panels. Unlike most skyscrapers today, the building features an architectural design typical of pre-World War II style. In 2009, the buildings common areas underwent renovation in an effort to transform the structure into a more eco-friendly building. In the late 18th century, the site was first developed as the John Thompson Farm. There was a stream at that time that ran across the site and emptied into a pond that was located about a block away. In the 19th century, the site was once occupied by the renowned Waldorf-Astoria Hotel, which was frequented by the elite of New York. The opening of the building coincided with the Great Depression. The economy and the poor location made the already problematic vacancies worse. Because of the shortage of renters, the local residents gave the building a nick name of the Empty Building. In 1951, Roger Stevens bought the building and the illustrious sale was the highest price ever paid for a single structure. Over the years, the building has been the site of over 30 suicides. Today the building is more than a tourist attraction. The prominent building is part of New York history and a colourful beacon in Manhattan's skyline, as well as a destination for extraordinary views. Currently, the Empire State Building has its own zip code and houses over 1,000 businesses. In 2007, there were 2,700 employees reporting to work each day, making the majestic building, the second biggest single office complex in America.